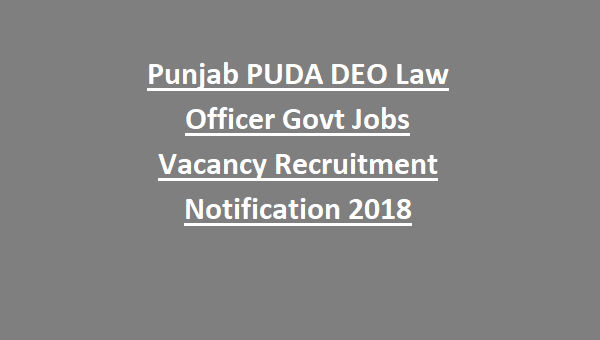 Punjab PUDA DEO Law Officer Recruitment /Exam 2018: Punjab Urban Planning & Development Authority released a recruitment notification for Data Entry Operator & Law Officer Jobs on regular basis. There are total 57 vacancies opened for DEO and Law Officer Post through Punjab PUDA Recruitment for the current year. Note: For category-wise distribution of vacancies refer the official notification. Candidates applying must be below 37 years and above 18 years as reckoned on 01-04-2018. For OBC/SC/ST, relaxation of 5 years in upper age limit. In case of Ex-serviceman, years of service shall be deducted from the actual age and considered eligible according to it. i)Graduate in any discipline from a recognized University. ii)Possesses a Computer Information Technology course equivalent to “O” Level certificate of (DOEACC) of Govt. of India. Graduate in Law with at least three years of experience as Advocate. Applicants who have successfully submitted their candidature for FHW Post will be assessed on the basis of merit obtained in the Written Exam based on syllabus as per the minimum required qualification. Written Examination: It will consist of 100 objective type questions divided into 5 sections of equal weightage. Each question carries one mark. Medium of Question paper will be English and Punjabi. Candidates interested can apply online through the official website http://www.puda.gov.in/ before the last date i.e. 23rd July 2018. 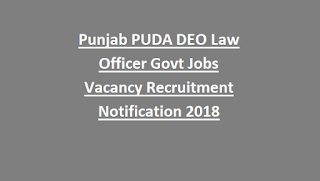 Candidates seeking possession under Punjab PUDA DEO Law Officer Recruitment 2018 can refer the official notification.